There’s a new tech support scam doing the rounds, and this one fools users into thinking their computer has crashed. Fortunately, Microsoft is aware of the issue, and has detailed how to identify the scam, and then remove the resulting malware from your PC. 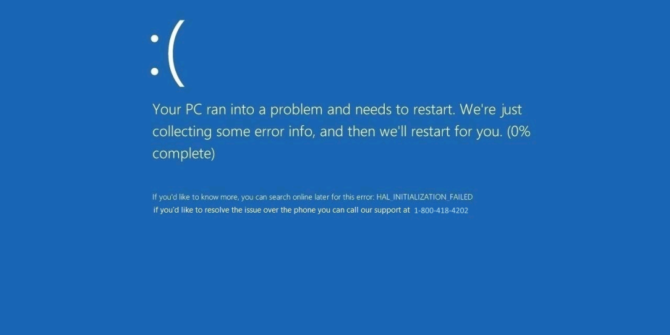 Anyone who has used Windows will be well acquainted with the Blue Screen of Death (BSoD). These occur when Windows crashes, or, as Microsoft describes it, suffers a fatal system error. They’re annoying, but you can usually resolve them simply by rebooting your computer. However, the Blue Screen of Death is now being used to initiate a tech support scam. Which is one level up from tech support scams which start with a direct phone call Anatomy of a Scam: The "Windows Tech Support" Con Examined Anatomy of a Scam: The "Windows Tech Support" Con Examined They're constantly on the prowl: cold calling scammers claiming to be from "Windows Tech Support". We were targeted by one of these con artists and here's what happened. Read More . According to TechNet, Hicurdismos is a fake Microsoft Security Essentials installer usually delivered via a drive-by download. Once installed, Hicurdismos displays a fake BSoD error message, hides your cursor, and disables the Task Manager. This is all designed to make the victim feel helpless. However, unlike a real Blue Screen of Death, this fake one includes a phone number for a customer support helpline. Anyone ringing this number will be asked to pay to fix the problem, when there isn’t even a problem to fix. Which is ingeniously evil, it has to be said. It should go without saying, but if you get hit with Hicurdismos, don’t call the number. Instead, scan your PC using Windows Defender Offline, and then report the incident to Microsoft and your local scam-reporting organization. Ideally, you would avoid installing Hicurdismos in the first place. Which means being careful to only install programs from legitimate sources. Microsoft is keen to point out that the SmartScreen Filter built into both Internet Explorer and Microsoft Edge would flag this threat. It really comes down to using common sense when browsing around the interwebs. As Fox Mulder constantly said in The X-Files, “Trust No One”. Have you ever been on the receiving end of a tech support scam? How did you deal with the phone call? What do you do to ensure you’re only installing legitimate programs from legitimate sources? Can we trust you? Please let us know in the comments below! Explore more about: Microsoft, Windows, Windows 10, Windows 7, Windows 8. How do you scan your PC using Windows Defender Offline? Since the cursor and task manager don't work, do I hold the power button and just shut down? Will I have the use of my cursor when I reboot? yes - do get one such call, every so often. until I've got to their 'level two support'. at which point, I'll usually just hang up. - sometimes, they'll even ring back !. not good for those that do get suckered in, though. Yes, I was hit just recently, fell for the scam, stupid me, talked for an hr with the "MS" tech. He showed me on my pc all the foreign files (prob. his), etc, said I had Zeus, damaged firewall, etc. "BUT" I can fx it for you. . ." Thankfully my bank blocked the card, thru AARP Scam Alert. Then 2 of my computer expert friends (in the business), told me what to do. Thank you for the education. And the bank issued me a new card. I now know that MS does not send an audio message either. Just got a call today! He said he was from Norton - I used them years ago, but they must have been hacked because he knew my email address and my old OS. I'm almost all Linux now, so I just poked him a little and called him names. I usually only install software directly from Google or Microsoft, and I also perform regular maleware scans with (Malewarebytes Anti-Malware). And another thing that I do if I have no choice but to install 3rd party software, is to make aure that the top web address says [https:/] and not something sketchy like a site with [in.] in the front or back of the web address. I play along and egg them on. Especially if I'm near people. It usually makes for an entertaining time. I happen to know quite a bit, so I can make up quite a bit. Yep, hit me twice. I wasn't lady like when I called to tell them they are idiots. As soon as they say they are from Microsoft, I tell them to F the hell off, and hang up.